The growth of imported cotton linter demand could be traced back to 2015 when China’s import volume reached 20-year high. 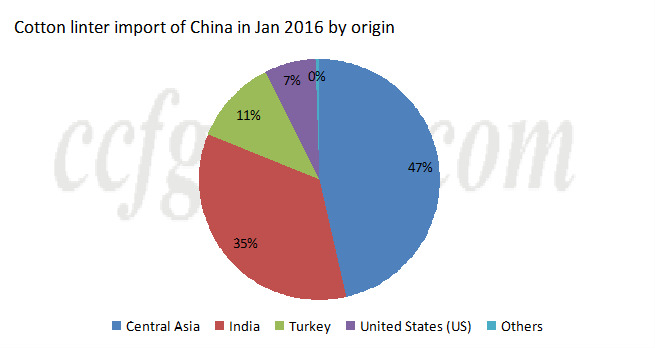 In Jan, 2016, cotton linter import of China kept increasing, hitting new highs of 28kt. The increment of imported cargoes in 2015 was mainly attributed to the following factors: 1. higher stocks in overseas market and cotton harvest in neighboring countries led to increasing potential supply; 2. Low selling rates of imported cotton linters like Indian cargoes interested Chinese buyers, then the purchasing volume expanded sharply; 3. there was stronger demand for imported linters amid production cut and higher prices in China. 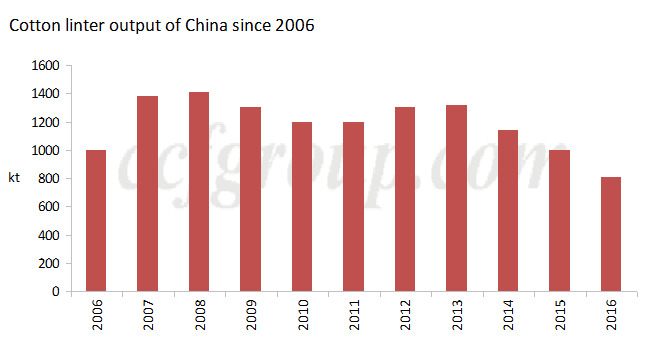 China cotton planting areas continued to slip. In 2015/16 season, the decrement of areas reached above 20%, down sharply compared to last season and output is also projected to decline by nearly 20% year on year. Consequently, cotton linter production with shrink in line with falling cotton output, which is expected to reach 10-year low of less than 900kt. Rigid demand still exists despite of reducing cotton linter supply. China cotton linter pulp mills are running with low operating rates of 30-40% but some of them started to procure more foreign cargoes. Meanwhile, there is steady demand from refined cotton, paper and specialty pulp industry. 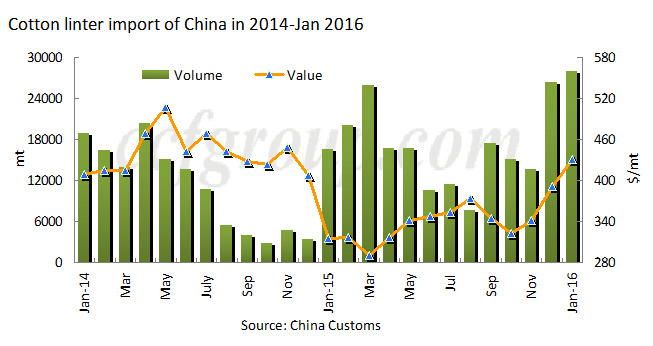 According to customs data, China imported 197.919kt of cotton linter in 2015, up 53.56% on the year. In Jan 2016, the volume hit new highs. India and Central Asia remain major sources of imported cotton linters as the volume from those regions accounts for more than 80% of total. However, the import from Syria reduced significantly since 2015 and even no cargoes were sourced from that country in Jan, affected by wars. In overseas market, the suppliers also operate business of other cotton-by products besides cotton linter. The distribution of those enterprises is dispersed and scale is small, with monthly supply of 100-700 tons, so there are many agents in the market who collect linters and then sell them. According to USDA’s latest data, world cotton production is estimated at 21.82 million tons in 2015/16 crop year, 5.18 million tons of which is contributed by China, accounting for 1/4 of total. China producers 1 million tons of cotton linter per annual, based on 1/4 of world cotton output while the yield of cotton linter is rather low in overseas market, so the potential supply outside China is expected to be huge. In order to have comprehensive understanding of Chinese market and give a platform of communication between sellers and buyers, CCFGroup will host cotton linter trade meeting during 10th China Hangzhou Cellulose Fiber (Viscose) Industry Forum in later May.